The MACAULEY VINEYARD label was originally established in St. Helena in the early 1980s by Ann Macauley Watson and for several years produced a very well received late harvest Sauvignon Blanc with help from renowned winemaker, Ric Forman. In the late summer of 2000, Ann’s son Mac went to work for Rudd Estate in Oakville. After several months of winery work and education he was inspired to revive the family label, and, working with winemaker and childhood friend Kirk Venge, crushed his first grapes in October 2001. Mac and Kirk have one goal: to source the highest quality fruit in Napa Valley and make wines of extraordinary depth and personality. The grapes they choose showcase the terroir of the vineyards and create a remarkable wine-drinking experience. 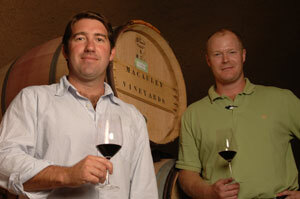 Second-generation winemaker Kirk Venge grew up in the Napa Valley. At his father's side, he learned about farming and winemaking, feeling at home in the cellar at an early age. While pursuing his enology degree at the University of California at Davis, Venge worked at Mumm Napa Valley for five years in their experimental division. Upon graduation, Venge sought to expand his winemaking knowledge by traveling to New Zealand and working harvest in the southern hemisphere. Equipped with a broader sense of viticultural techniques, Venge returned to Napa to partner with his father in the creation of Venge Vineyards. Today, Venge brings his skill and passion to Macauley Vineyard. Those who know Kirk Venge will attest to his acute palate. His wines reflect balance and finesse. Because Kirk believes that wines are made in the vineyard, he is relentless in his quest to find the very best vineyard locations and sources of fruit.